Arch Linux is a rolling Linux distribution. This means you need to install Arch Linux only once, and your system will remain up-to-date forever. Arch is largely based around binary packages. Packages are targeted for i686 and x86-64 microprocessors to assist performance on modern hardware. A ports/ebuild-like system is also provided for automated source compilation, known as the Arch Build System. Arch Linux focuses on simplicity. The package manager, for example, does not have an official graphical front-end — but makes use of well-annotated configuration files and extensive use of shell scripts. The target audience for Arch Linux are people who are comfortable in editing text files to configure their system, and entering commands in terminals. Package management tool - Pacman. 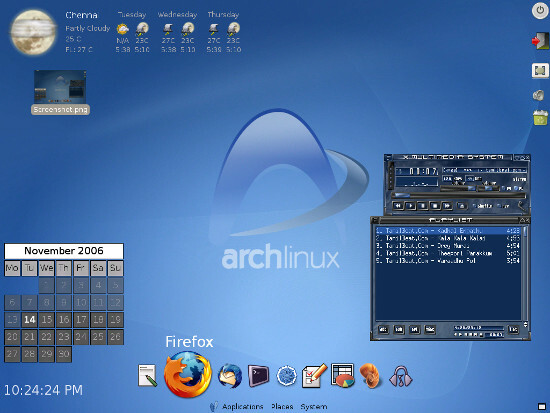 Arch Linux celebrates its 10th birthday in March 2012. Arch Linux - A sleek, fast Linux distribution - Dec 2008.